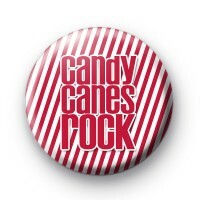 Candy Canes Rocks Christmas Badge in red and white candy stripes with Candy Canes Rock written in a festive red font with white outline. We have a great selection of Christmas badges available, including a range of candy cane badges. These badges are super cute and ideal to give out over the Xmas season. Christmas badges make great stocking fillers and can also be given out as small secret Santa gifts. Standard 25mm badge made by hand in our UK workshop.